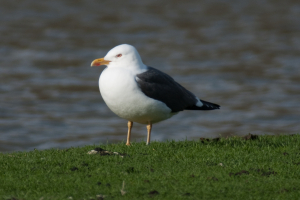 Observation - Lesser Black-Backed Gull? - UK and Ireland. Description: Whilst some of my bird id has improved I still struggle with gulls. Dark back and yellow legs pursuade me that this is a Lesser Black-Backed Gull. confirmation or other ideas most welcome! Whilst some of my bird id has improved I still struggle with gulls. Dark back and yellow legs pursuade me that this is a Lesser Black-Backed Gull. confirmation or other ideas most welcome!